Did you hear the news? 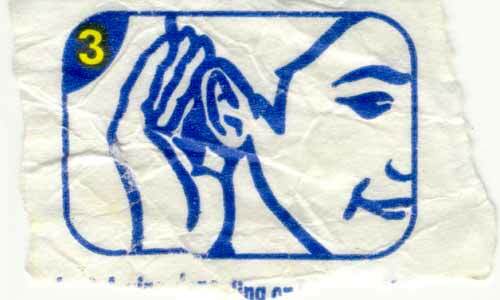 Part of a popcorn wrapper found in Joey’s party house. Jo, a.k.a. Joey Rainbow, hosted a bangtastic party in her gaff near the office. There was a great mix of people there; everyone was on a great buzz. Most people became terribly drunk, as the photos going around the office of Ger shows. Ger rang me on Tuesday morning to warn me against putting them on the web. Joey prepared Skittles Vodka for the occasion, a shot of which was handed to me as "cranberry juice." Once I knocked the shot, the room came alive. The ceiling turned all coloured and started dripping on everyone, I suddenly remembered all the dance styles from the 90's and thought I could do them really well. The music seemed to stop suddenly in the middle of a song, and it felt like I was able to walk in and out of the windows. I filmed one chap making a magic fag and I got an earful for making videos of such things. Everyone seemed to be there - Mohamed, Brian, Steve Farrell, lots of pretty girls and well-dressed groovy boys. Fun and games. Paul Little is getting married to Trish in Wicklow on Thursday. Deirdre Corbet is home, drinks in Roddy's on Thursday evening. The Love letter virus brought under control in office. Superstyley.com goes online with beautiful HTML/ASP/CSS version. Confused user asks "what in the name of God is this site?" about Waltzer.net. Obviously it's not for you baby. What are ailing companies doing these days to reduce costs? As more and more big companies get into financial difficulty, we find out how they have been keeping costs down. Gillo ordering food in TramCo on Sunday afternoon.